Valentine’s Day is almost here and of course it brings to mind love and romance. Sometimes we have a true romantic in our lives and sometimes we don’t. Romance audio books have long been a way of enjoying the fantasy of romance to the extreme. 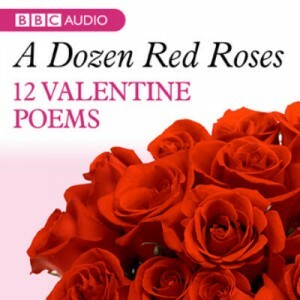 Not only do we have a big collection of the romance authors you love on audio I was also able to find an interesting series of Romantic Valentines Poems in our collection as well. It is part of a full series of poems that can be bought together or individually under the Dozen Red Roses Series of poems. Most fans of Romance books whether in print or on audio have been fans for a long time. I remember reading my first Harlequin Novel in my teens and getting hooked. Another favorite in my youth was Danielle Steel who balanced stories of romance with strong female characters. Even before then I became a fan of Jane Austen, whose classic books are still enjoyed to this day. Nora Roberts Many of her books are considered Thrillers too. Another series of books that is popular for the romantic angles they usually contain are our Vampire Audio Book collection. This month you can use the coupon code romance at checkout to receive a 20% discount on your order (Sorry this is no longer valid). Wishing you a Romantic Valentine’s Day!